I have been told that all five of the Halifax Explosion commissioned films may be broadcast on CBC TV at a later date. Until then, enjoy the work online via YouTube. And if you were one of the 130+ people who participated in this film by drawing a frame, THANK YOU! This film exists because you helped. I hope you are pleased with the results. If you have any questions or feedback on the film, you can email me through the 'contact' page on this site. About a year ago, I was asked to participate in a commissioning project commemorating the 100th anniversary of the Halifax Explosion. Aside from seeing documentaries and visiting the Maritime Museum of the Atlantic, I'd never thought very much about this historic event... probably because it was so devastating and horrible, and just too hard to get my head around. I live within a local world full of reference points to this history: local bars serving up shots called "Halifax Explosions," the Halifax Pop Explosion, etc. Lots of ways in which this huge event is superficially referenced in our popular culture. In fact, when I thought of pairing Halifax Explosion and film, one of the first things that popped into my mind was the filming of Shattered City about 15 years ago. When Hurricane Juan hit Halifax in 2003, rumour had it that those behind the film were a little miffed because they'd already wrapped production, and all those flattened trees from the hurricane would have really looked amazing in the movie. So when AFCOOP commissioned me to make a short animated film, I naturally Googled "Halifax Explosion" and checked out a number of hits on YouTube. The very first video I saw wasn't a slick documentary or a staged re-enactment. It was vintage film footage posted by the Nova Scotia Archives. Of actual survivors, only two days after they endured the biggest explosion prior to nuclear weapons. I was mesmerized. Turns out a local commercial photographer, W. G. MacLaughlan, had filmed several minutes of motion picture footage only 48 hours after the explosion took place. There is 13 minutes of this footage online, available for anyone with an internet connection to easily access. Even more astounding to me: although there was ample footage of broken windows, decimated landscapes, and twisted iron rails, a lot of footage focused on people. Ordinary citizens. Opening crates of relief supplies, helping the military lift stretchers of wounded victims, picking through wreckage. In almost every shot that had people in it, everyone was actively helping out. Cleaning up. Getting on with it. This is what hit me hardest. Not just because of their grit in the face of such devastation, but because this felt like the Halifax I know. We rely on each other so much to get things done around here. Often, it feels to me like that's the only way. After all, when you live in a depressed economy on the edge of a continent, you simply can't go it alone. This footage and this thought gave me a spark for my project. With the support of the Halifax Central Library, Wonder'neath Arts Society, and NSCAD's Artist for a Day event, I invited members of the public to trace frames I printed from this film footage onto 8.5"x11" paper. These tracings became a literal way through which participants could engage with the explosion and the images documenting it. Putting the tracings everyone made in order created rotoscoped segments that serve as a metaphor for working together, individual expression, and the tensions that may exist in between. How do we understand our own history through images? What is it that makes our local culture of interdependence what it is? What are the dynamics of giving and receiving help--both in times of crisis, and in the everyday? This film was commissioned by the Atlantic Filmmakers' Cooperative and funded by Halifax Regional Municipality as part of the city's Centenary events commemorating the Halifax Explosion. I am thrilled and grateful to be part of this project. The film created through this project will be screened on TUESDAY, DECEMBER 5th at Paul O'Regan Hall in the HALIFAX CENTRAL LIBRARY as part of AFCOOP's "REFLECTIONS OF THE HALIFAX EXPLOSION IN NEW LOCAL FILMS." Documentary Halifax Explosion: The Deaf Experience at 7pm, animated shorts (including mine) start at 8pm. The event is free, so if you're in Halifax, please attend! Fall is always the busiest time of year for me for teaching. You can find me at NSCAD University most days, but I've also been doing the occasional workshop at Visual Arts Nova Scotia lately, too. Local workshops in the city are easy to get to and a great mix of folks I know well and artists I'm meeting for the first time. But I feel extra lucky to get to go further afield into different corners of the gorgeous Nova Scotia fall landscape! Last weekend it was Bridgewater, at Art Happening, for a Grant Writing workshop. Next weekend (Nov 4-5) it'll be Sydney, Cape Breton for a two-day retreat, called "Work it! Work it! Boot Camp for Artists." Excited to see a new city and meet more of my peers across the province! If it's not in Venn diagram form, I probably can't know it. If you're in Chicago this weekend or Taipei next month, please check out the Butter Elbow Animation Festival! My short film "And When Alone, Repeat" is in some very good-looking company. Wish I could be there with my film to check out all the work! Wanted: stories of neighbourliness and care in times of trouble (for my Halifax Explosion film). I am making an animated short film about the recovery efforts after the Halifax Explosion. Over the past several months, hundreds of people have helped on this project by volunteering to draw the images I animated. I now need to create the sound for the film, and again, I need help. I am looking for individuals who are willing to share their stories of neighbourliness and resilience in Halifax. It could be about times of disaster affecting whole communities, like Hurricane Juan, or times of personal need, like sickness, loss of a job, or loss of a loved one. I will be booking times to record interviews and conversations over the next two weeks. I must have all recording completed by November 3rd. I cannot offer much in exchange except for coffee, cookies, a film credit as a participant, and your own private copy of the final film. Why do I want these stories? When I first looked at W. G. MacLaughlan’s footage of the Halifax Explosion aftermath and relief efforts, I was struck by all the images of people jumping in to help each other out. These images, in a way, summed up my own experience of living in this city: precarity and disaster being pushed back at by loving, collective energy that buoys us. I’ve seen it here so many times, and I’ll be honest: it’s why I stay. I wonder if you’ve experienced this, too. What will I do with your stories? I want to combine these stories as threads to go along with the animation so many people have helped to create. You are invited to spend as little as 10 minutes with me, or as long as an hour. I’ll be happy to show you the animated images, too. I don’t have any super-structured agenda for these conversations. I can’t promise I’ll use every last bit of everything you say, but I intend to respect the spirit of your contribution. The final film will be screened in Halifax during the Halifax Explosion Centenary in early December and it will be on CBC TV, as well. How can we get in touch with each other? Please send an email to becka@beckabarker.info or simply message me if you’re already my friend on Facebook. The greater the variety of stories and experiences I can gather, the better I think this film will be. And of course, if you know anyone you think would be interested in participating, please help me connect with them! I can probably take on no more than 10 sessions in total over the next two weeks (the entire film is only going to be about 3 minutes long), so please don't hesitate to get in touch if you are interested. I have been so impressed by everyone’s willingness to jump in and help me with this project--but then again, that has always been the point of this exercise. It’s incredibly humbling and a great reminder of the spirit that guides my family’s choice to live here. Thank you, everyone, for your help on this small project so far. And thank you in advance for your help again! 2017 HIFF screens "And When Alone, Repeat"
This is the fourth year in a row that I have been lucky enough to be programmed in the Halifax Independent Filmmakers Festival, and I'm grateful to be part of such a strong program! After two years of premiering 'expanded cinema' film installation work, this year marks my return to the regular Atlantic Auteurs program. My new short film And When Alone, Repeat will screen as part of the Atlantic Auteurs II Program at 9PM on Thursday, June 8th. Tickets for the screening are available here. And When Alone, Repeat is a five-minute rotoscoped animation that explores layers of misunderstanding in image and language. GoPro footage from amateur weather balloons and Russian dashcams are paired with an old cassette recording of a high school choir's attempt to sing "Choose Something Like a Star," a musical arrangement derived from the Robert Frost poem of the same name. The pairing of these different kinds of reproductions reveals the power--and limits--of modernist assumptions around photographic imagery and quantitative science, and parallels this with the power and limits of images and sounds we create from our bodies. It was a busy year! Below are a few more highlights of events and exhibitions that went unmentioned here earlier in the year. 1) Place Holder III. Solo exhibition, Anna Leonowens Gallery, Halifax, NS. Oct 11th-22nd. Thank you again to the Anna for inviting me to debut the third installment of the Place Holder series this fall! Place Holder IV--the final installment of this series--will be completed in 2017. 2) The World Around. Single channel animation. RE:Member @ Centre for Art Tapes. August 25th, Halifax Central Library. RE:Member featured new works by CFAT members that centered on the idea of community, membership, and participation on multiple levels. 3) Place Holder I-III. Nocturne Art at Night. October 15th. For this year's Nocturne Art at Night in Halifax, I used the windows of Gallery 3 at the Anna Leonowens Gallery to present Place Holder I-III together for the first time. 4) And When Alone, Repeat. Animation With Love festival, Carbon Arc Cinema, December 2-4, 2016. The final exhibition of 2016 for me was this lovely local festival that has grown from a one night showcase of new local work to a three-evening festival including animated feature films and panel discussions on independent animation, the local industry, and what it means to be experimental. Above: Panel on Local Animation in Halifax. Below: Panel on Independent Animation. Carbon Arc photos. Despite the challenges 2016 presented me (and so many of my peers), I was grateful for the opportunities. I look forward to 2017 and the completion of my largest project to date, The Evolution of Max, as well as my final installment of the Place Holder series. Here's to a great 2017! The show is up! And Toronto, you've treated me so well! After a packed opening (no small feat considering there are multiple film festivals and an audio festival also happening right now) and a fun artist talk panel (see below), I'm packing up to head back to my little port city. What a whirlwind trip it's been. Props to Madi Piller for the intriguing curatorial concept and for including me in such a great roster of artists. Kudos to Clint Enns for the smartypants essay. And much awe and respect to the TAIS team on the ground, who worked tirelessly to install all week last week: Jenn Snider (TAIS Operations Manager), Alex Nagy (Installation Tech), Evan DeRushie (TAIS President), and Felix Heeb (TAIS Vice-President). One of my favourite things about this show is how diverse the work looks, but at the same time, how coherent we all were in responding to the curatorial prompt. If you are in Toronto between now and mid-December, please head up to 1411 Dufferin St. to check it out. Talking artists at the artists' talk panel discussion, OCAD. L-R Leslie Bell, Stephen Broomer, me (taking notes I didn't end up needing! ), Sabrina Ratté, Nicholas Sassoon, Marten Berkman, and moderator Clint Enns. Photo credit Jenn Snider. Many thanks to Arts Nova Scotia Presentation Grant for making my travel and participation in the installation, opening, and panel talk possible! Gerard Choy and I have been working in collaboration fairly consistently over the last few years. He lives in Singapore and I am in Halifax, Canada. Even though we had been regularly connecting on-line to discuss ideas and progress on projects, we hadn't seen each other in person in three years! What a delight it was to present our work in Montreal and to spend a week working face-to-face at the same table. Gerard and I presented in response to a prompt given out by our session chairs, Sarah Hollenberg and Andrew Kear. Their provocative prompt about "the creative potential of signal decay," in reference to a centre-margins view of modernism 'spreading' immediately led us to re-examine Walter Benjamin's ideas of the 'aura' of the original. It was a wonderful week full of exciting ideas and connections with academic peers. We are grateful to Sarah and Andrew for inviting us to present and to UAAC for their support. In the coming months, I will be posting more about the work Gerard and I have been doing on this site. I was one of four lucky local artists who was chosen to participate as a mentor in the 2015-2016 Visual Arts Nova Scotia Mentorship Program. I was paired up with the wildly talented Anna Taylor and had a fantastic time reflecting on both our practices in myriad ways over the past year. This program culminates in a group exhibition every year, and ours is on June 29-August 7 at the Craig Gallery in Dartmouth, NS. Left: Anna Taylor, Moral Code (cotton thread on linen, 26″ x 24″) and right, Becka Barker, Place Holder II: 110/300 km/hr (digital video, 1920x1080). Installation shot from How We Are Talking, VANS 2015-2016 Mentorship Program Exhibition. The show, titled How We Are Talking, also features new work by Alice MacLean, Claudia Legg, Sophie Paskins, James MacSwain, Ian McKinnon, and Mathew Reichertz. Find out more about it here. I spent most of my time in a cool, dark room under some cool LED lights working on some new work at Toronto Animated Image Society. This new work, commissioned by TAIS, will be part of an exhibition at the PIX Film Gallery in Toronto in fall 2016. More details to come! Oh, and that sweater? I didn't need it until I got back to Halifax. I'm pleased to announce that this summer, I'll be one of seven artists creating new animation work through the Toronto Animated Images Society (TAIS). 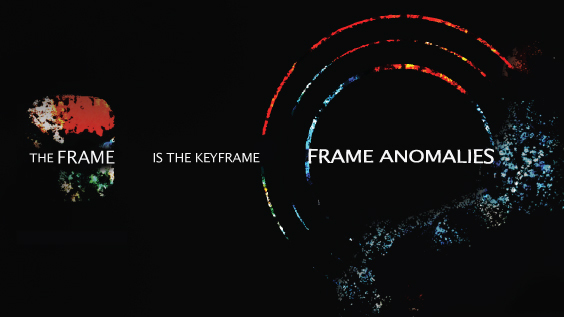 We're responding to the prompt "The Frame is the Keyframe: Frame Anomalies." The new work will be shown this November at PIX Film Gallery in Toronto. This commissioning project is curated by Madi Piller with an essay by Clint Enns. Looking forward to spending a few weeks in Toronto this summer getting to know TAIS and its artists! Place Holder: Waterfowl Rice (2016), still from 16mm film loop. Please join me on Wednesday, June 8th, for the opening of my show at Hermes Gallery in Halifax. This exhibition, Place Holder: Waterfowl Rice, is in conjunction with the 10th annual Halifax Independent Filmmakers Festival and runs from June 8th-12th. I'm very pleased to be presenting new work in HIFF again this year! My recordings are completed, my equipment has been checked, and my small army of volunteers is now organized: it's time to reveal "How to Say," my first audio installation, for Nocturne 2015. Each location has a unique collection of recordings relating to their chosen location. The recordings are the traces of a sort of speaking game where pairs of speakers were asked, simply, to imitate the sound their partner made, as faithfully as possible. The words used in each round reflect the speaker's idea of Halifax. Eventually, sound and meaning become detached. Meaning speakers originally convey is no longer contained by the sounds of the utterances; it drifts into the negotiation between the speakers. Where the assumed meaning is lost in the words, a new meaning may be found in the relationship between speakers. My piece will be installed at six locations around the festival. You can listen at any of these locations on headphones. And I am happy to report that not only will this work be installed at all these locations, but it will live on long past the festival as a free app for Android devices on Google Play Store. (iOS version to come later.) You can download it here. Thanks in no small part to my super-skilled and talented brother, Garrett Barker, I managed to create a new set of hanging 4x6 light boxes for this year's NSCAD Alumni Exhibition. It's a show and sale, and I can confirm from the sneak peek I had today that there is some super-fine stuff from real living artists that'll get snatched up fast. If you're in Halifax, stop by the newly-renovated Anna Leonowens Gallery to check it out. Show closes October 9th. Fun fact: a 6x4 photo frame can perfectly display 24 frames of 35mm motion picture film. I am pleased to announce that I am creating a new work as a 'Beacon Project' for this year's Nocturne Art at Night scheduled to take place on Saturday, October 17th, from 6pm - midnight in Halifax. My new work, How to Say, will mark my first time creating an audio piece. More on this as the festival gets closer. Many thanks to Nocturne for inviting me to participate! The Carbon Arc Cinema has existed largely as a labour of love here in Halifax for the past five years. What better way for the cinema to commemorate its anniversary than with another instalment of Animation with Love? For this screening, I was asked if I could create a cinema version of my installation, The Hundred-Eyed Satellite. The result is The World Around, a meditation on the process of making and exhibiting that installation. I am pleased to be premiering it at The Carbon Arc's anniversary screening on July 16th. The screening starts at 8pm, but be sure to come a few hours early--there'll be some serious noms just outside at the Halifax Food Truck Rally earlier that evening! Many thanks to curators Siloen Daley and Dylan Edwards for including me in this program! I'm about to go pick up a projector from AFCOOP and head up the road to Sackville, NB for the day to install my work as part of Struts Gallery's summer exhibition series, The Living is Easy. You can check it out in the back gallery for the next couple of weeks. And hey, why not make an afternoon of it and see the shows up at the Owens Art Gallery, too? Stop in at The Black Duck or Mel's for some food and top the day off with a drink at Thunder and Lightning where you can chat with your friends about what you saw. Nothing better than an art road trip in the summer time! I'm about to head downtown to start installing my film loop piece, Wander With Care, which will be up for one night only at the Halifax Independent Filmmakers Festival. I'm told doors open at 6:30pm, and the piece will run continuously through the evening in the main corridor of the Neptune Studio lobby. Also at the Neptune Studio Theatre tonight: HIFF will also be screening a special program of shorts, REprogram, selected by Claudette Godfrey (SXSW), Lydia Beilby (Edinburgh International Film Festival), Curtis Woloschuk, and Dan Karolewicz (Festival du Nouveau Cinéma, Montreal), at 7pm in the Neptune Studio Theatre. At 9pm, HIFF will be screening Jem Cohen's Museum Hours. Screenings include Q&A sessions afterward. All this and a bar! And popcorn! Hope to see you tonight. When someone asks you to list five things you're obsessed with, what would you say? A fun exercise, but harder than I thought it would be! All content on this site is the creative work of Becka Barker, unless otherwise noted. This work is licensed under the Creative Commons Attribution-NonCommercial 4.0 International License. To view a copy of this license, visit http://creativecommons.org/licenses/by-nc/4.0/.